How to decorate a nursery. Also, how NOT to decorate a nursery. The biggest test of my marriage so far might have been deciding how to decorate the nursery. When we started planning it last fall, Dave wisely remembered how hard it was to find rugs we liked and suggested that we start literally from the ground up. I wanted to start with the color scheme — specifically, I wanted to use the color scheme from our wedding (robin’s egg blue and red) because I have a ridiculous amount of fabric left over. Dave was never a big fan of the blue. We started with the rugs. 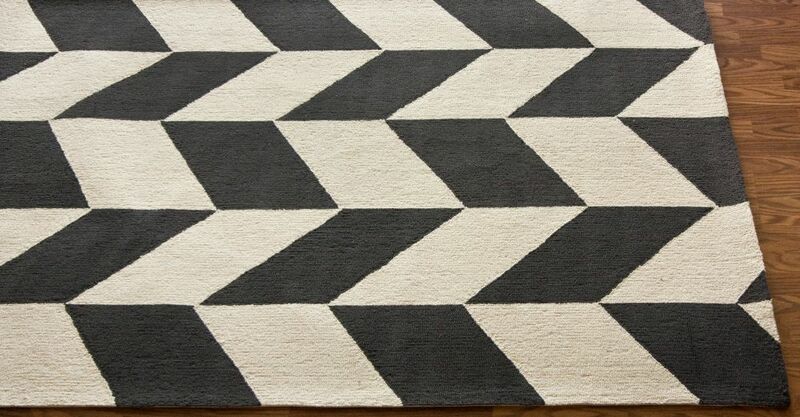 I probably looked at 500 rugs online, and although I am prone to exaggerating numbers, this particular number might be an understatement. Why did it take us so long? He hated all of them. 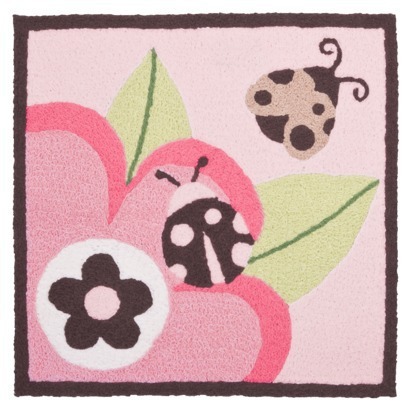 Finally, miraculously, we found a rug we could agree on! 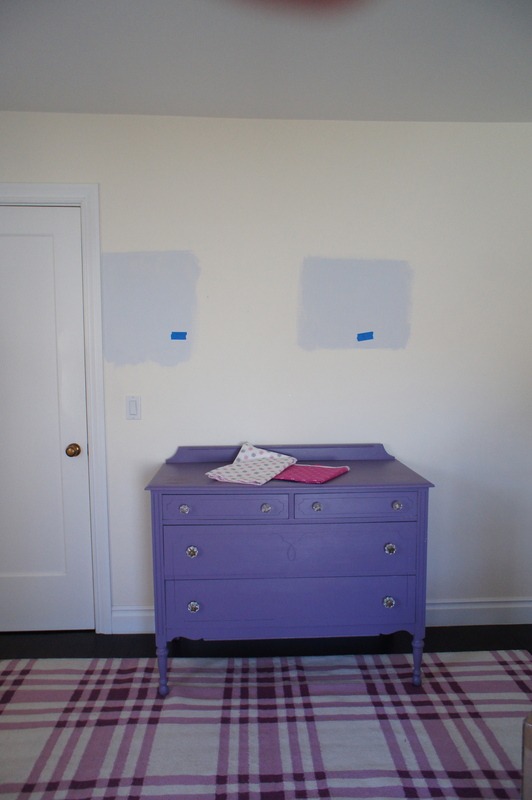 And the purple would match my purple dresser! COLOR SCHEME PARTIALLY IN PLACE! YAY! I started looking at sheets and coordinating fabrics. This dresser does not match this rug. Only, when it arrived, the purple rug I thought I was getting was actually raspberry/orchid. It looked awful with the dresser and didn’t match the fabrics and sheets I had been looking at. Time to start over. I looked at hundreds of pictures online, went to a bunch of fabric stores, searched through kids stores, and ultimately discovered that fun baby stuff comes in pink, blue, green, purple, and gray. It does not come in raspberry or orchid. I had spent so many hours planning this nursery and still all I had was a rug. I began to loathe the rug. I fantasized about burning it. That was a little extreme. NAVY BLUE AND PINK! Girly but not too girly! Appropriate for a baby yet not dripping in pink princess butterfly-ness! The nautical theme was a fun reference to my family’s seafaring heritage (grandfather was a ship’s captain, we had a boat, and Dave’s family has always had a house near a lake)! AND, there was a pattern with girl pirates! FUN! So, we painted the walls a pale blue gray. 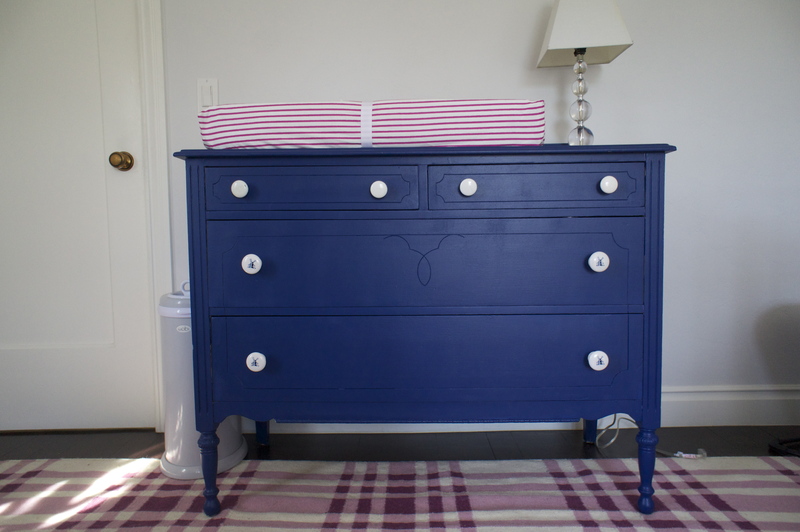 Our purple dresser became navy blue. And I’m making everything else (sheets, changing pad cover, curtains) out of the Michael Miller fabric. The baby is 3 months old and we’re still not finished, but after several big delays (baby being born, cross-country trip, etc. ), we’re finally making progress. It is going to be done by the end of July. I swear. But here’s a little preview. So much better with the blue, right? And the moral of the story? It’s OK to start with a rug when decorating a nursery, but make sure it’s in a baby-friendly color (or coordinates with a baby-friendly color).